Spacious one bedroom apartment in La Cala De Mijas. Fantastic location, no car required, walking distance to all amenities. 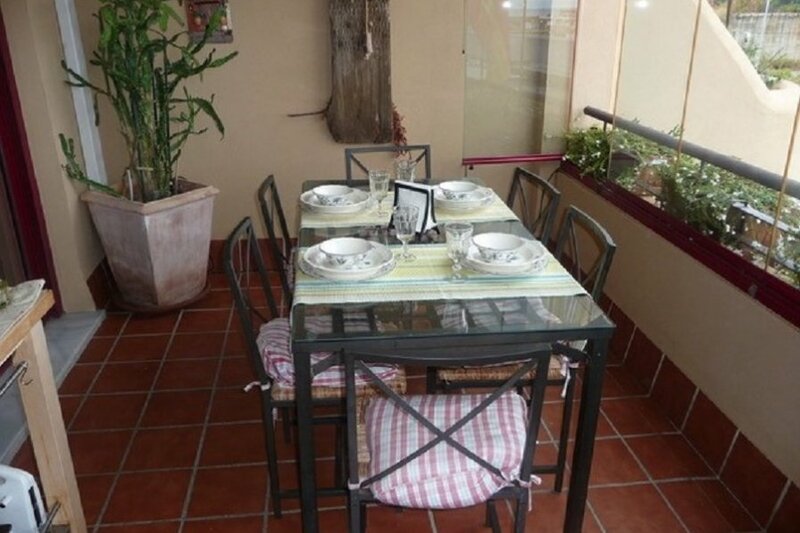 The apartment is in a fantastic location, walking distance to beach, the village and all the bars and restaurants. Just a few hundred metres from the bus stop if you wish to explore all the Costa del Sol has to offer. This 1st bed apartment is spacious and bright with a south facing balcony, the balcony has glass curtains which you can have opened or closed. The Bedroom has a king size bed . A spacious open plan living/dining area and a separate kitchen. There is a double sofa bed in the lounge . The bathroom has a bath with overhead shower. The apartment comes fully equipped for with everything you might need during your stay, air conditioning/heating, washing machine and dishwasher. It is a short stroll from the apartment to a selection of bars and restaurants to choose from Batutta for an evening drink or Snack Attack open all day for breakfast and snacks, there is a Lidl supermarket on your doorstep stocking everything you might need during your stay. A five minute stroll will take you into the village where there is a wide variety of bars and restaurants to choose from. From typical Spanish cuisine at the Venta Sorroche to fine dining at Little Geranimum or a cocktail at the jet-set Olivias La cala. The complex has a large pool and also a childrens pool. There is a bus stop directly outside the complex where you can travel to Fuengirola or Marbella. For the golfers, there is the 9 hole La Noria, a 5 minutes walk away, or Santana Golf Club and the well know La Cala Resort are a five minute drive away.